These only apply when you are listening to audio from the TV on the Sonos Playbar. If while watching TV you use the Sonos Controller on your phone or tablet, look at the room display (see below). It will show “TV” as the source. It will also show two options near the bottom of the screen: a moon on the left side, and a caption symbol on the right of the screen. You can toggle them on and off with a touch. The caption is on in this case (yellow). a message appears when you toggle them. The caption symbol is a “dialog enhance”, that boosts the volume of dialog making hard to hear dialog a bit easier. The moon symbol is “night sound” and it compresses the dynamic range of surround sound audio – makes soft sounds louder and loud sounds lower. Night sound is useful when watching a movie at a lower volume (not disturb people) and/or so you don’t not have to be constantly be raising and lower the volume when watching a show with loud and quiet scenes. The effect of these two features depends on the audio program, your room acoustics, and your personal preferences. 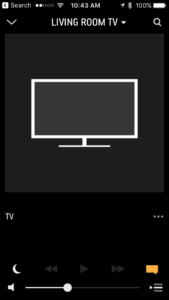 They disappear and have not effect when you switch from TV to any other Sonos audio source (not designed for for music). Once set, they remain on or off for TV audio till you change them. Many people like to leave the dialog enhance on all the time.